Clearly I love movies if I’m spending this much time writing about them. Even better than finding out details on new and upcoming films is getting to review them. I have always given my friends and family suggestions on TV shows or films they should watch. It may take them a while to come around to doing it, but once they do, they’re as much in love with it as I knew they would be. I have one friend that is still snubbing my suggestion of a cure for depressing days by watching Cameron Crowe’s ‘Elizabethtown’, but he’s not like everyone else. So I don’t count him. I’m good at this if I know you. I watched ‘Le Chef‘ earlier today. I really enjoyed it. The story-line wasn’t all that unique, but a good play on it. Professional vs. amateur is always a good re-imagining of an often-used strategy to increase viewers because you don’t have to think too hard about what you’re seeing. I’m not saying this film is low-class that is definitely NOT the case. It is wonderfully French in it’s simplicity. 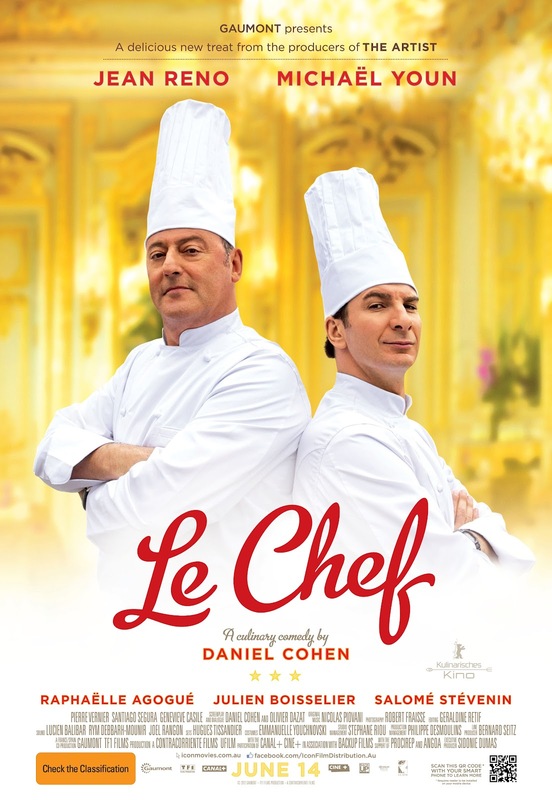 ‘Le Chef‘ is the story of an awarded and accomplished chef , Alexandre Lagarde, that is butting heads with the restaurant group’s new CEO. The reason for the discord is simple. The young CEO wants the restaurant, named after the very chef he wants to remove, to turn the 3-star rated brasserie’s food into the world of molecular gastronomy. While this is taking place there is a young chef, Jacky Bonnot, that wants to create culinary masterpieces and has not found a job that will allow him the creative freedom he desires. Jacky is a fan of the creations of Lagarde and jumps at the chance to work with him. The pair team up to create a dazzling spring menu to ensure the restaurant retains it’s famed 3-star status. It’s light-hearted and pretty remarkable when you look at the lead role. I was surprised to see Jean Reno (‘Léon: The Professional‘)in the leading role, playing the auteur-elite that Jacky learns so much from. The role of Jacky was played by Julien Boisselier (TV’s 2011 ‘Xanadu‘). Overall, it was a vibrant, fun, french film that had one particularly amusing scene. To gather information about their competitor that will win the restaurant if they fail to keep their 3 stars, Lagarde and Bonnot dress incognito to visit the opposing chef’s gastro-pub and see what all the hype is. 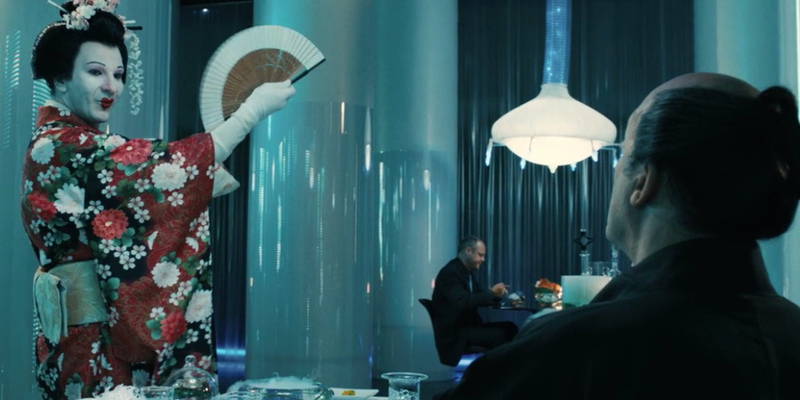 To remain anonymous Reno poses as a Japanese ambassadorial official in full ceremonial dress and Jacky poses as his equally made up, wife. The laugh comes when the pair decide to help themselves to a few of the restaurants ingredients by way of Jacky performing a fan dance (all the better to rob you with) that Lagarde refers to as a digestive dance. Which I applaud the writer-director Daniel Cohen, for not going way over the top and making it slapstick. It was amusing, but not insulting. Those with Japanese heritage, I’ve heard felt differently during one screening. The movie was fairly straight-forward and simple. Even without subtitles, I think you could follow the film. Maybe that’s just the last few months of me and the kids trying to learn French. Any way you want to look at this picture it was light and airy, no real substance to it, there were a few chuckles, no big belly laughs. It’s all filler, no protein. One of the lines that I remember most from the film and it really has some profound meaning to it in the right context and it’s the idea that cooking from a recipe is the same as singing karaoke – both ideas are trying to copy someone else’s art, and usually badly. I was interrupted and had to pause the movie at least 20 times this morning as I tried to watch it, I never lost track of what was going on, could easily get back into it. It’s movie fluff. Keep trying Cohen, one of these times it’ll be worth the 3 gold stars this restaurant holds, but for my take, the movie gets only 2 stars. Here’s Paul’s Review of ‘Le Chef’, Starring Jean Reno!! This entry was posted on Monday, July 21st, 2014 at 6:58 pm	and is filed under Film, News, Reviews. You can follow any responses to this entry through the RSS 2.0 feed. You can skip to the end and leave a response. Pinging is currently not allowed. « ‘Louie’ Receives a 5th Season at FX! !